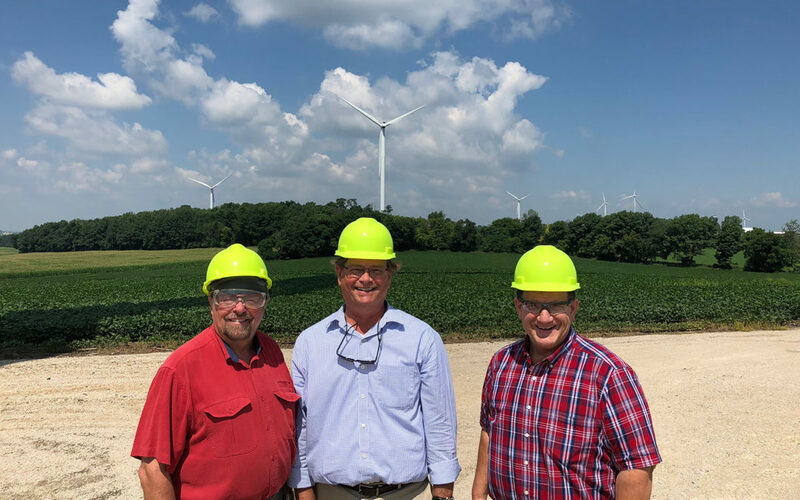 On July 24th Alliant Energy hosted a tour of their Cedar Ridge Wind Farm in Fond du Lac County for several state legislators to discuss not only wind, but all of the latest developments in renewable energy. Built in 2008, Cedar Ridge was one of the first wind installations in the state. Alliant Energy owns and operates this site of 41 turbines that has a capacity of generating 68 mW of electricity, enough to power 17,000 homes. In its 10 years of existence, Alliant calculates that the electric power generated by these wind turbines allowed them to avoid burning enough coal to fill a 99-mile-long coal train! Alliant currently owns 569 mW of total wind power, but because of falling costs, efficiency gains of the turbines, and inexpensive operations and management, they expect to invest in an additional 1,150 mWs of wind generation by 2021. 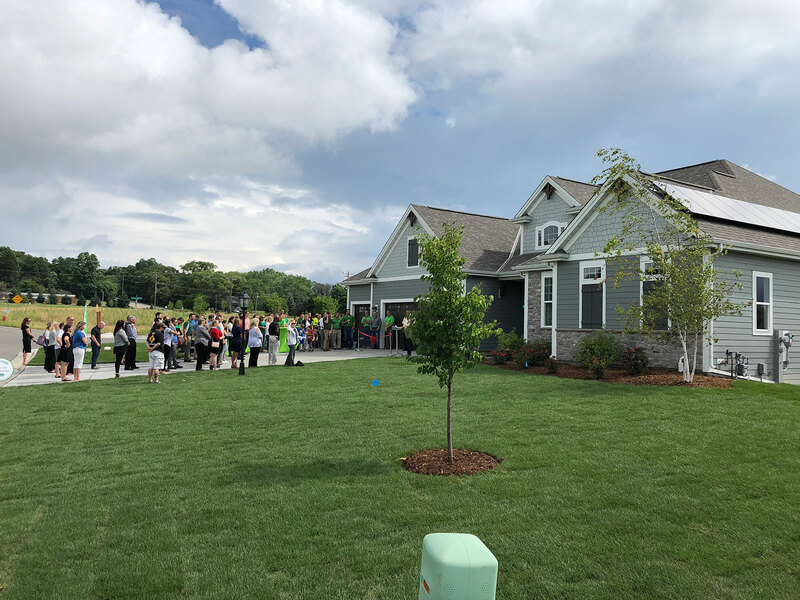 Representatives Bob Kulp and Rick Gundrum came away impressed and posted very positive comments online about the tour and the many developments in renewable energy. 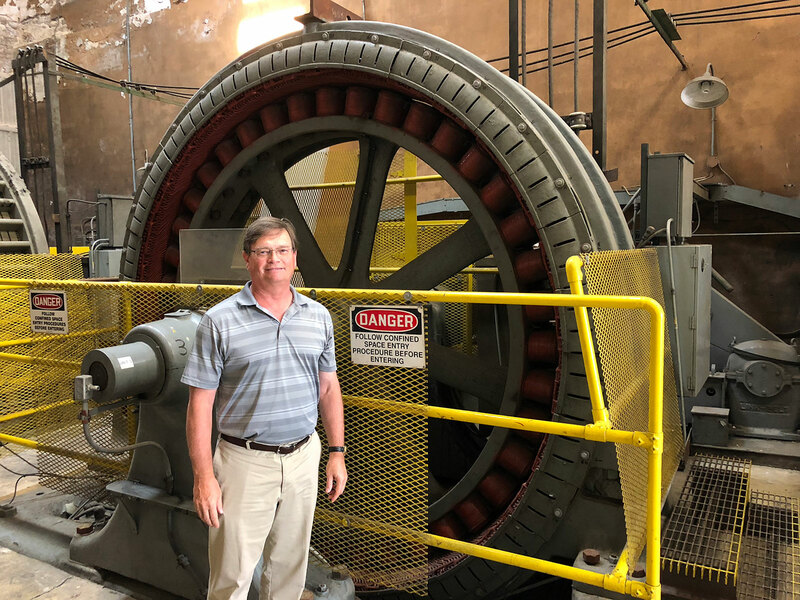 On July 13th I joined State Senator Rob Cowles (District 2-Green Bay) and Representative Dave Murphy (District 56-Greenville) on a tour of the Badger Hydroelectric plant in Kaukauna. The visit was hosted by the Kaukauna Municipal Utility, a member of WPPI Energy. As noted in this WBAY news story, the visit was designed as a discussion about renewable energy of all kinds. Hydroelectric power was one of the first, and least expensive sources of electric power. The Kaukauna facility is 110 years old and had a major upgrade in 2013, giving it a capacity of 7 mW of power, up 40% from the capacity of its two old powerhouses. During the meeting we discussed the dropping prices for wind and solar power and the tremendous amount of renewable energy that is currently listed on the 4-year MISO planning queue. It was noted that WPPI Energy, Dairyland Power and the investor owned utilities are looking to close their coal burning power plants and invest in utility scale wind and solar projects. They are doing this because wind and solar cost less than coal and the rising customer demand for renewable energy. This competitive, market-driven demand for renewable energy has led Wisconsin to easily surpass the 10% Renewable Portfolio Standard (RPS) that was established by the state legislature in 2006, and shows no signs of slowing! On July 9th I was invited by Energy Bank, Inc. to attend the unveiling of a new product called FUSION. Neal Verfuerth, owner of Energy Bank, invented this new lighting system that uses the DC power output from photovoltaic solar panels to directly energize LED fixtures – without conversion to AC. 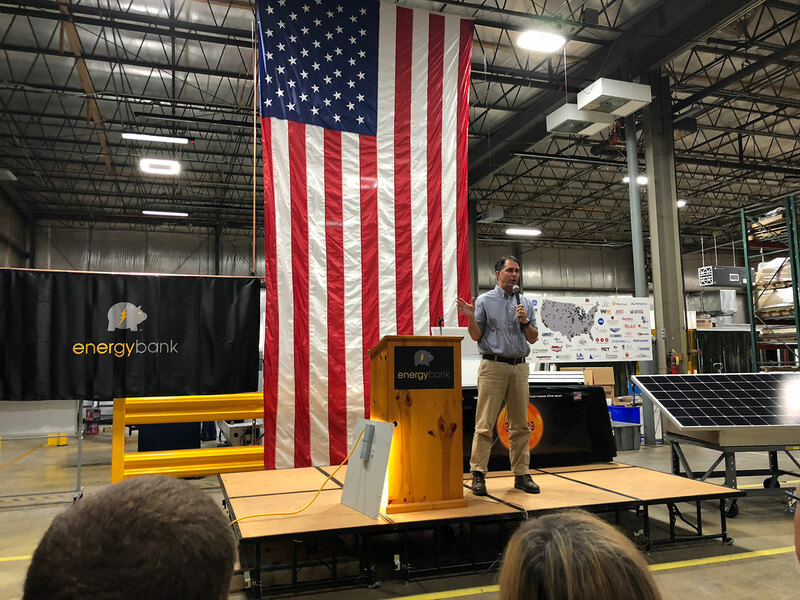 Governor Scott Walker gave the keynote speech where he said Wisconsin companies understand the need to keep their peak energy demand low and reduce the overall cost of energy to be economically viable. Walker said that businesses understand that “to be environmentally sustainable, you need to be economically sustainable”, and products like FUSION make that happen. The Governor was excited about innovative and high-tech companies like Energy Bank locating in Wisconsin, creating the new era technologies that will create jobs and attract millennial workers to Wisconsin. I had a few minutes to speak with both the Governor and Representative Paul Tittl (District 25-Manitowoc) at the end of the event about the exciting advancements and fast falling prices that renewable energy has had in the last few years. They were very interested and are looking forward to working with RENEW to help keep that momentum going. On the weekend of June 15-18 I had the pleasure of visiting the MREA Energy Fair in Custer. This was my first visit to the Energy Fair and all I can say is that I was blown away! They had an amazing number of great seminars (over 250) on renewable energy, energy conservation and sustainable practices of all kinds. I was able to see, sit in and learn about many different electric vehicles (over 70 of them were on-site) and discuss with EV aficionados what the exciting future of transportation might look like. There were also over 450 exhibitors, presenters and sponsors from around the country. There were great speakers, entertainment and interesting people everywhere you looked. Everyone was up-beat and excited about renewable energy and how quickly it is taking over the energy market. 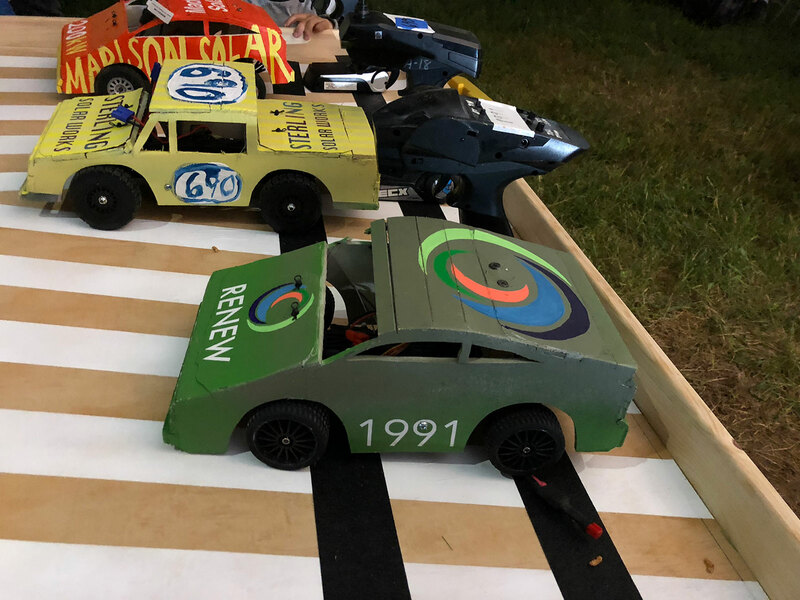 Finally, the most fun part of the weekend was having me drive the RENEW Wisconsin electric demolition derby car. I won my initial heat and was in the final event. A controversial call by the umpires and a slight miscalculation on my part kept me out of the winner’s circle, but at the end of the evening everyone was a winner and we all had a great time! !